The Homecoming dance is a rite of passage for all teenage girls. This is because of the prized Homecoming Queen title. I’m sure you have your dress sorted and picked the makeup to go with it. But what about your hair? 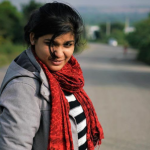 With so many hairstyles to choose from, picking the best one seems like a herculean task. Have no fear! 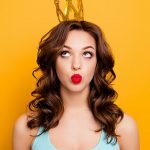 Here are 30 stunning homecoming hairstyles that will give you everything you need to become Homecoming Queen, princess, and duchess! Curls are number one on this list because they add a romantic vibe to any hairstyle. They also make your hair look voluminous and shiny. Style your curls in a blooming flower updo to create a surreal hair look. 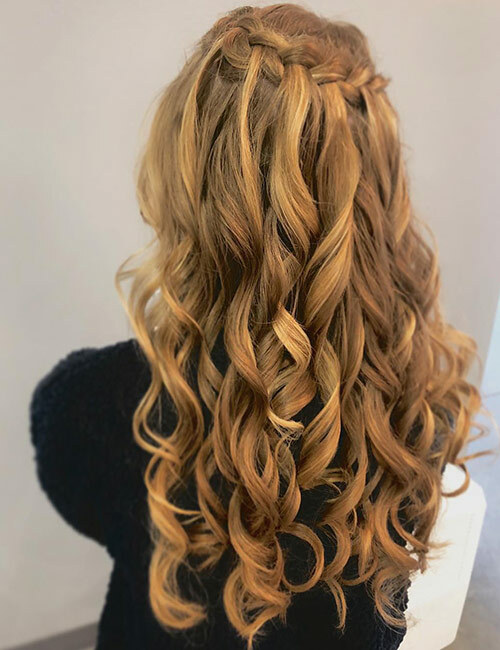 Curls accentuate any braid that’s done with them. 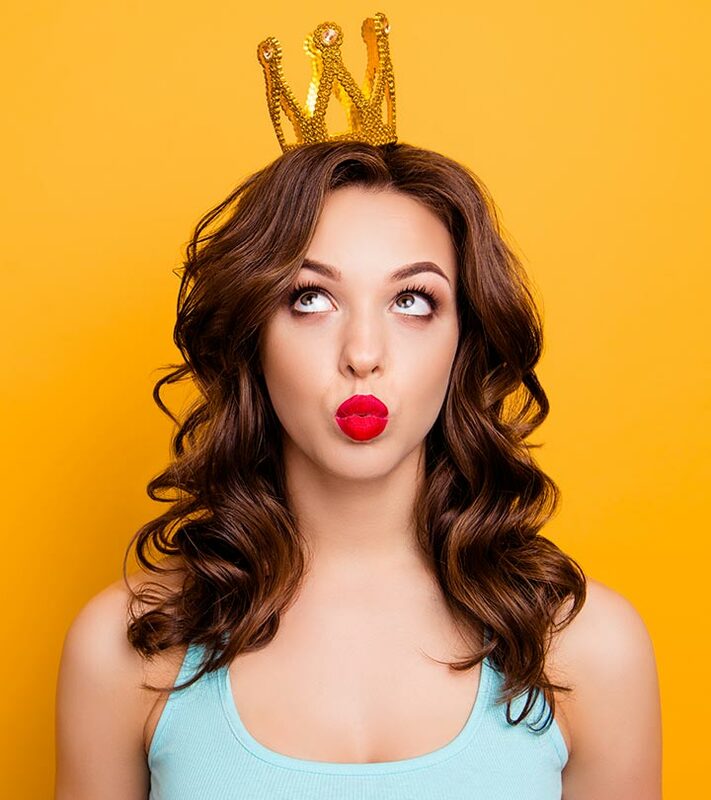 Style your hair in big curls with the help of a curling iron, velcro rollers, or a round brush and blow dryer. Part your hair on one side and weave a side accent braid. 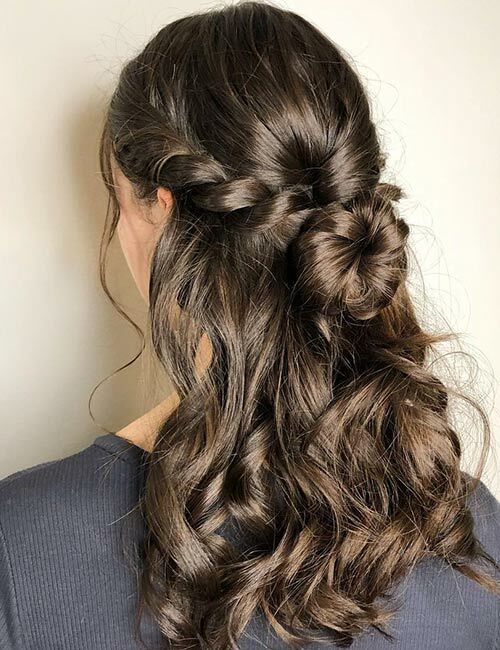 This hairstyle looks perfect with a long, flowy gown. Tie your hair in a half ponytail. Flip the ponytail within itself twice. Pick up some hair from one side, near the front. Divide it into two and twist both sections together. Tuck the ends of the twist into the flipped ponytail and pin it underneath. Do the same on the other side as well. Wrap your half ponytail in a bun and finish off the look with some hairspray! The boho look is incredibly trendy. Boho braids, in particular, look absolutely stunning. They’re messy, beachy, and laid-back. This is a great hairstyle to sport if you are running for homecoming queen because it goes well with a tiara! Are you a free spirit? Well, homecoming is the perfect time to showcase who you are! Go for a hair color that matches your personality. 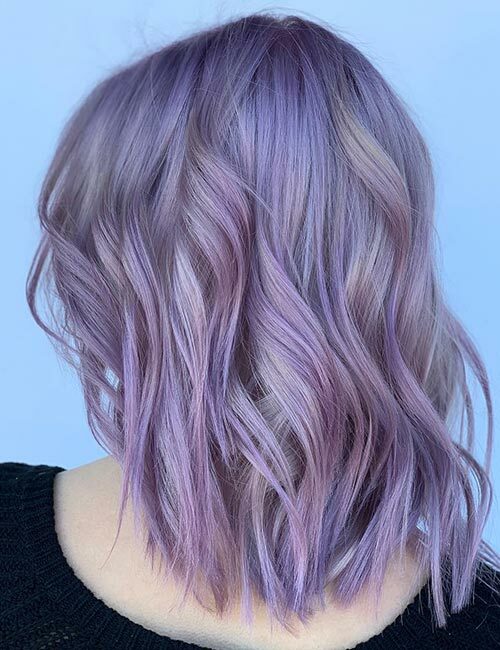 This lavender unicorn hair blend, for instance, not only looks gorgeous but is also a great conversation starter (which will help you get those votes!). 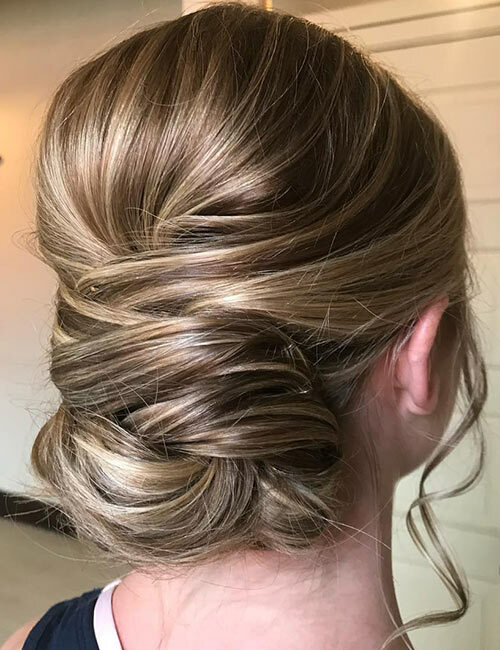 Perfectly placed curls can amp your updo to a whopping 100! 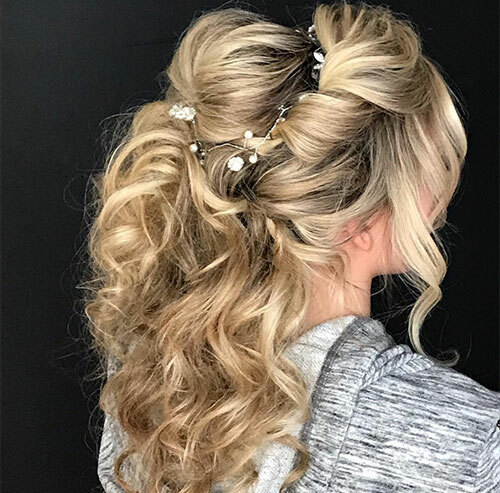 Sculpted curls lend an intricate elegance to your hairstyle and make for a stunning addition to updos. 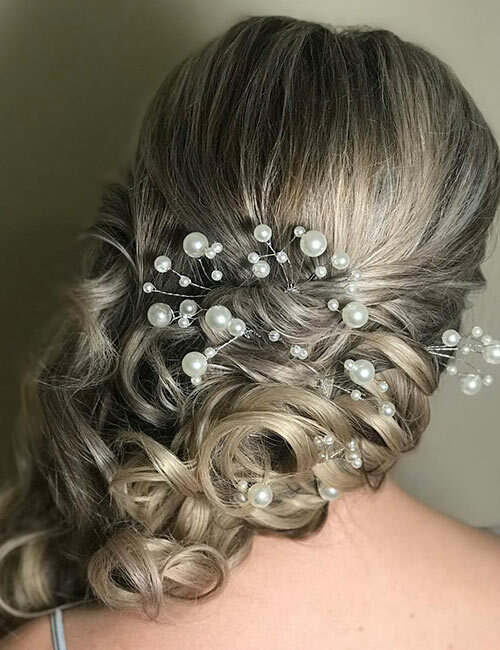 Add some elegant accessories to your hairstyles to feel like a queen. There’s something about natural beauty that just captivates people. This homecoming, opt to accentuate your natural locks. Use a curl defining cream to texturize your wavy or curly tresses. 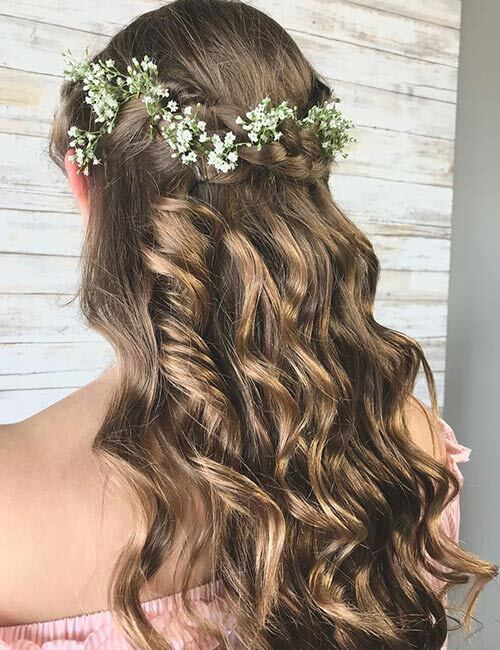 Accessorize your hairstyle with some real flowers to go with the natural theme. 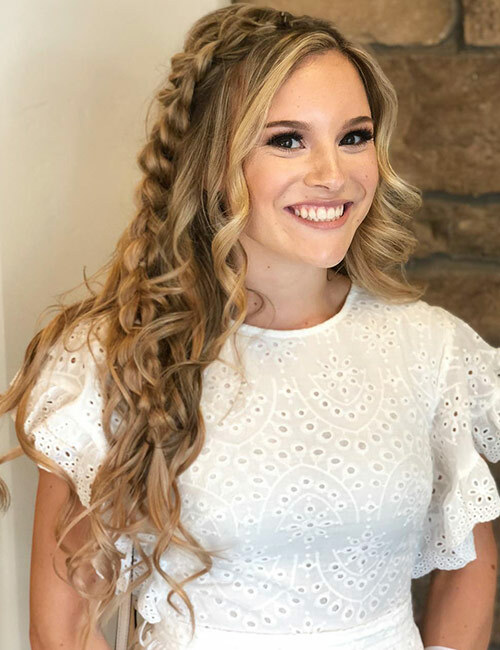 The waterfall braid is one of the chicest hairstyles to sport at homecoming this year. 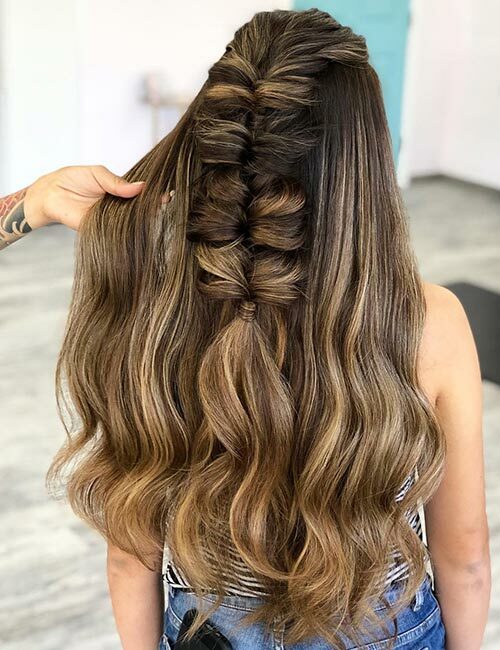 The key to a perfect waterfall braid is to take your time while doing it and use light mousse to give your hair a natural shine. If there’s one color on everyone’s Insta-feed right now, it’s pastel pink. This shade of pink is bright and peppy, making it perfect for homecoming. You can also add some dimension to this look by blending different shades of pink. Updos with twists and braids look intricate but are easy to achieve. Take this hairstyle, for example. Curl your hair and tie it in a bun using a chignon maker. Leave the curly ends out to give it a soft touch. 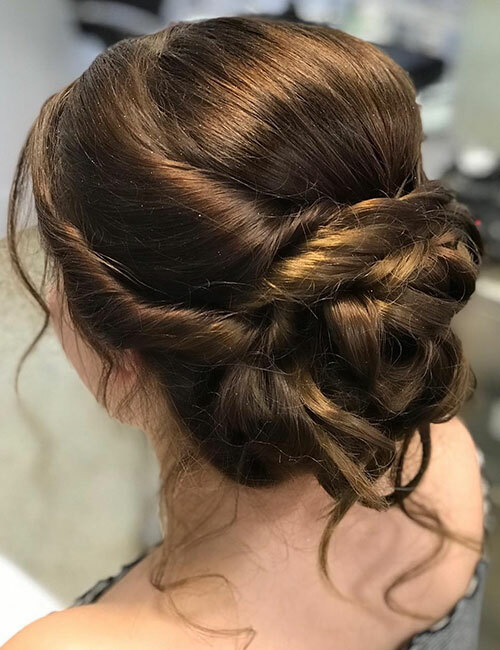 Twist and braid the sections of hair on the side. Tuck the braids and twists within the bun. 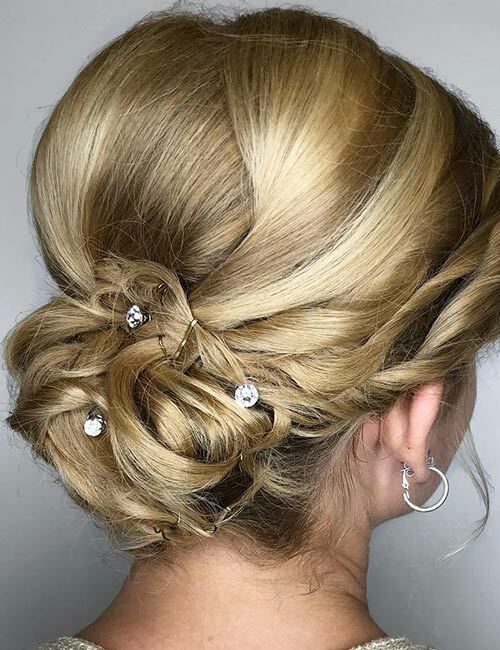 This is the perfect hairstyle to sport on a ball gown. 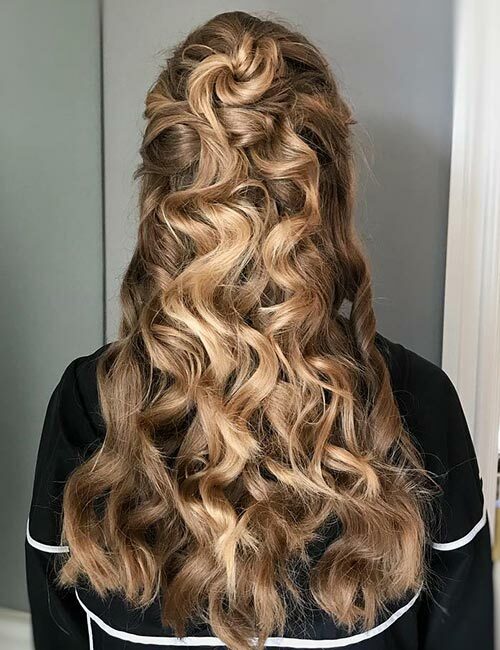 At homecoming, one thing is for sure: your hair will not stay in place all night. To look flawless and put-together right until the end, opt for a messy low bun. Style it with some accent braids to accessorize the look, and you’re good to go! Just got a balayage done? 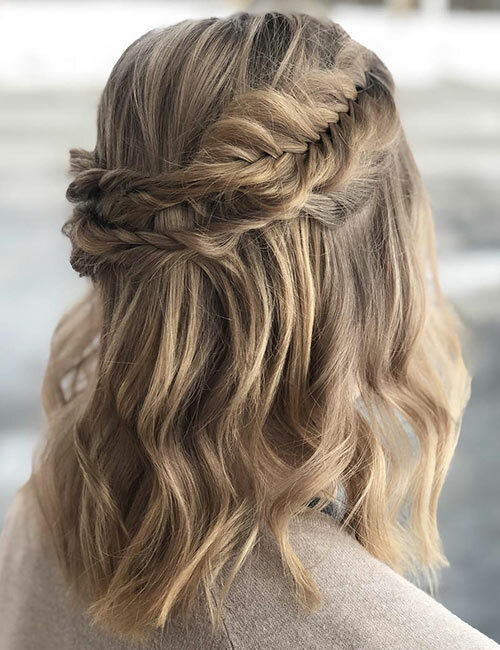 Flaunt it with this crown braided half updo! 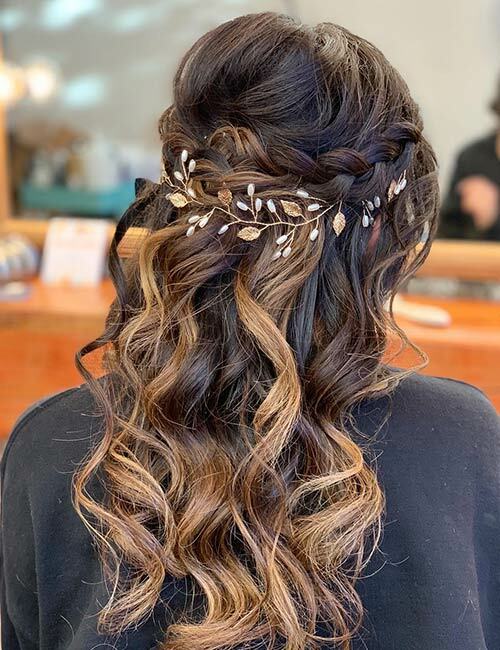 Weave your crown in a cascading braid style to achieve this look. To accentuate your hair color even more, curl the ends of your locks. 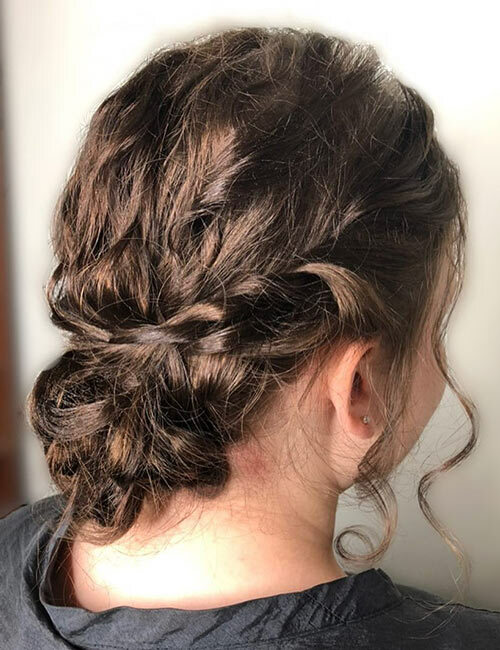 This low twist is inspired by the French twist. Leaving the hair at the sides, comb the rest of your hair back. Tie it in a low flipped ponytail. On the final flip, pin your hair underneath to form the bun. Pick up the sides, overlap them, and pin them beneath the bun. 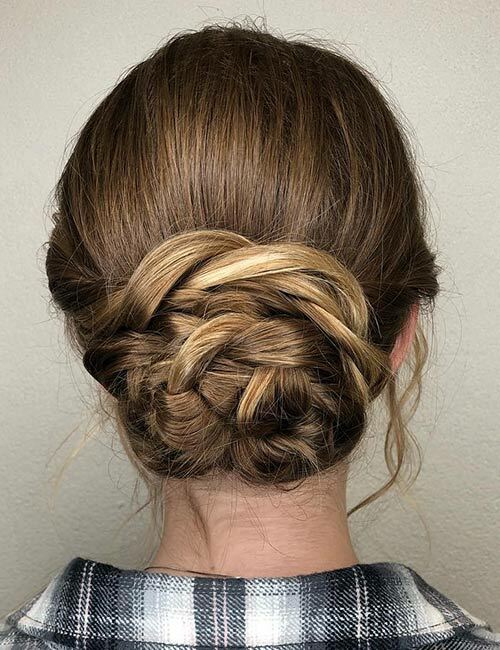 The braided bun is the new messy bun. 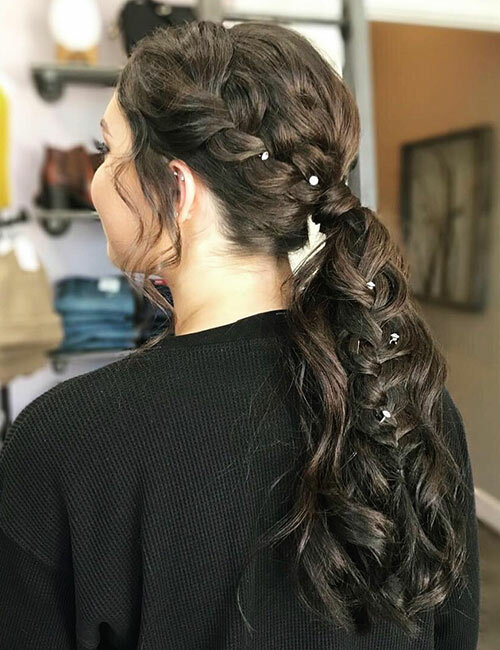 Braids add a romantic touch to hairstyles. 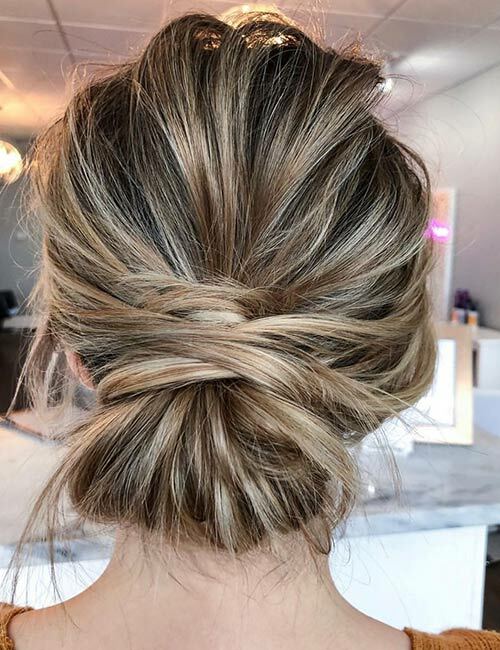 This woven hairstyle with loose strands makes for a stunning low bun. Don’t forget to spritz on some hairspray to keep your hair in place. 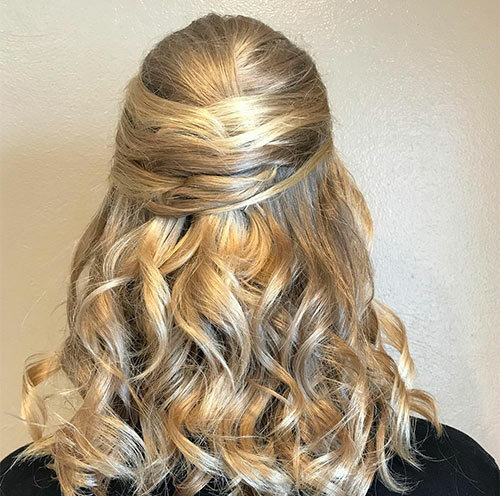 If you’ve been thinking about coloring your hair, homecoming is the best time to do it! 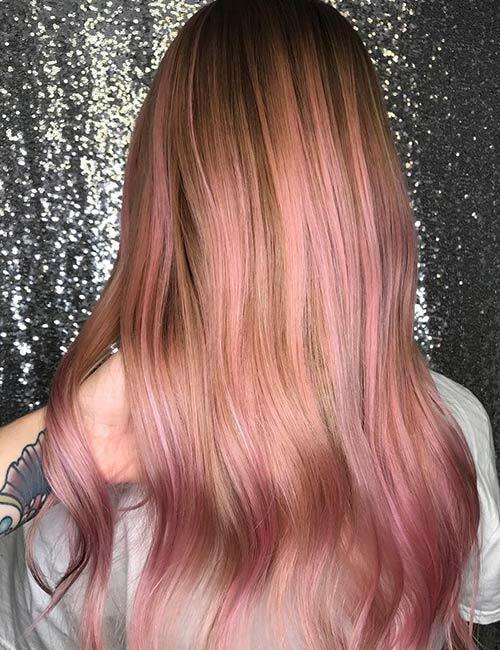 The highly coveted rose gold hair color has been flooding my Insta-feed for months now. 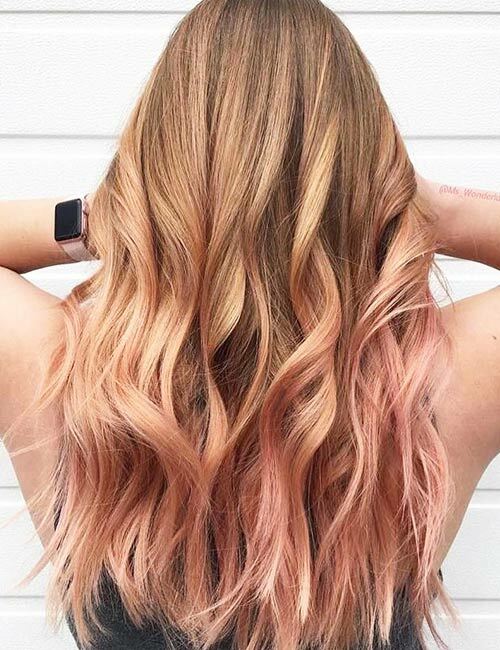 Instead of going full rose gold, opt for a balayage ombre. This will make the rose gold blend into your natural locks. Yes, rose gold is such a crazy trend that I had to put it twice on this list! Adding dimension to your hair can make it look thicker. 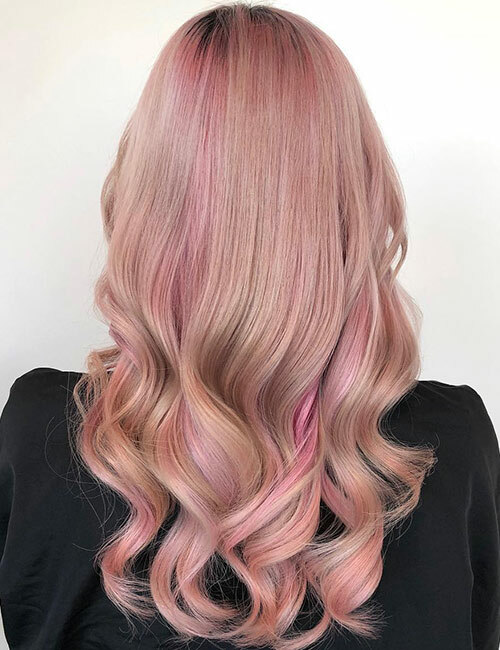 Opt for a rose gold dimensional blend to make your locks pop. This is the Upper East Side version of the low twist bun. There’s more hair that’s criss-crossed, which gives the hairstyle a fuller look. Curl all the loose strands of hair to lend an elegant touch to this look. I get that not all of you want to go for the mature updo look. Opt for a braided ponytail instead to showcase your style and look edgy. I would suggest a Dutch braided ponytail as it makes your hair look voluminous. Adding a slight bouffant can go a long way in making your hair look thick. Back comb your locks to create a bouffant. You can make it as big or small as you want. Tie your hair in a low bun and style it with some jeweled accessories. Braids are great for accentuating your hair texture. They look great regardless of your hair type, be it straight, wavy, or curly. Weave braids on both sides of your head and join them in one big braid and ponytail at the back. A delicate hair accessory can add elegance to your locks. 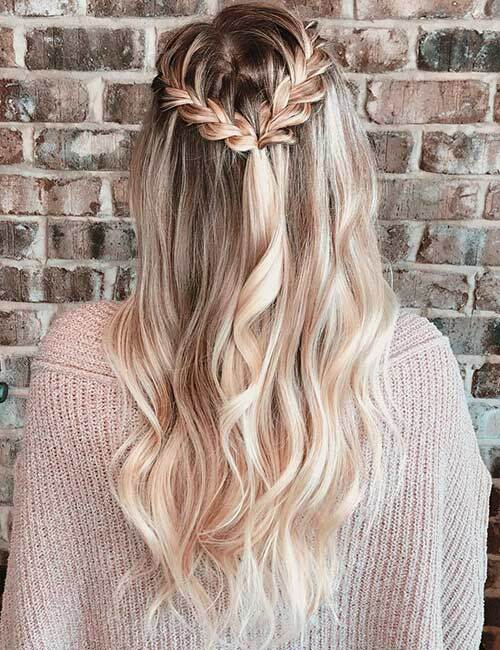 It can make a braided crown hairstyle (like this one) look like a million bucks. Opt for hair accessories with simple designs like a leaf or small flowers. You’ll be surprised at how much of a difference it makes to your hairstyle. Backcomb the hair at the crown. This will create a nice bouffant. Twist the hair on either side and pin it at the back. Pancake the twists to make them look big and add to the appeal of the ‘do. You can accessorize this look with a jeweled headband to add a luxurious touch. Heart braids look cute and romantic. Gather hair from one side and weave it in a French braid. Don’t add hair to the braid from below. Repeat the same on the other side and join the braids at the back below the crown. Pancake the braids to make the heart shape more evident. 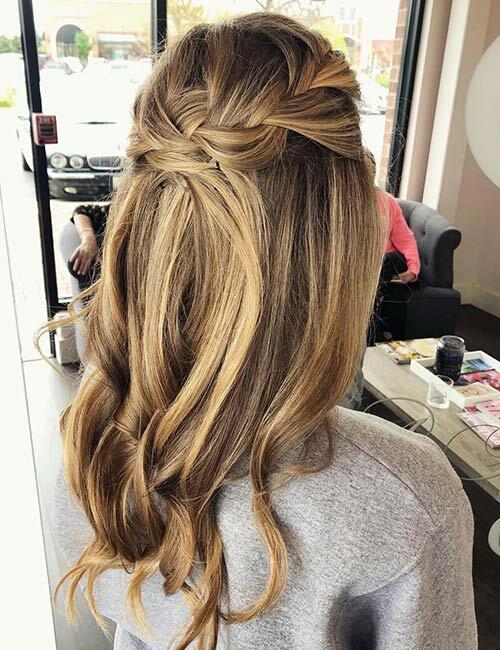 This hairstyle is simple and stylish. Tie the top section of your hair in a half ponytail. Overlap hair from the sides on top of the half ponytail to achieve the criss-cross look. This hairstyle looks great on short dresses. You can’t deny it – braids are a timeless hairstyle. 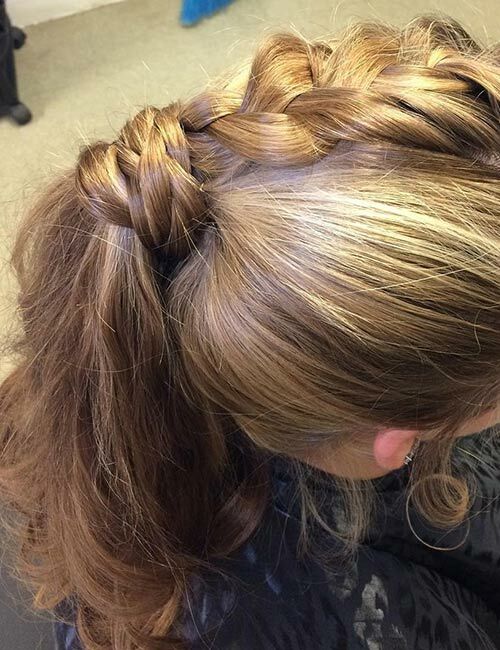 While small braids look great, I say, go against the mob and opt for a big half braid. Pancake the braid to add volume and dimension to it. You can even use extensions to make it look thicker. As elegant as most of the hairstyles here are, I couldn’t overlook the edgier styles. 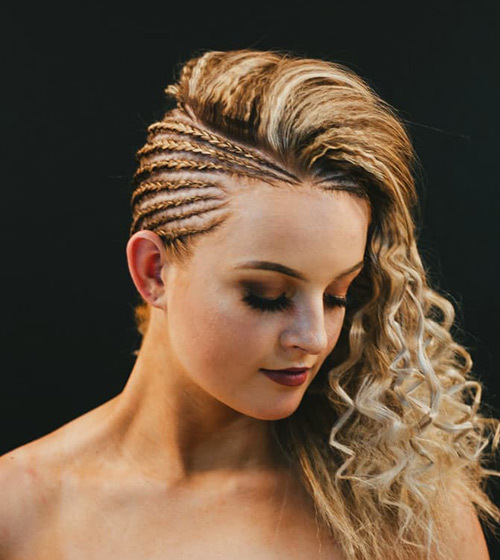 This curly braided undercut will definitely draw all eyes to you. 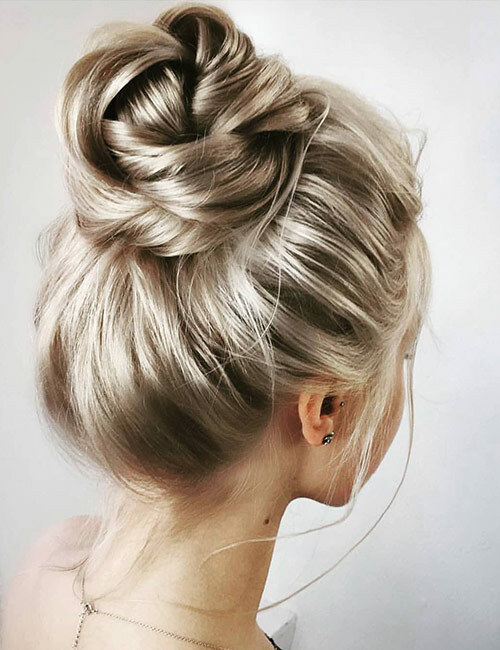 Gray is one of the trendiest hair colors to sport. It makes you look sophisticated and mysterious. If you want to go for a dramatic look for homecoming, consider going for this gorgeous color look. 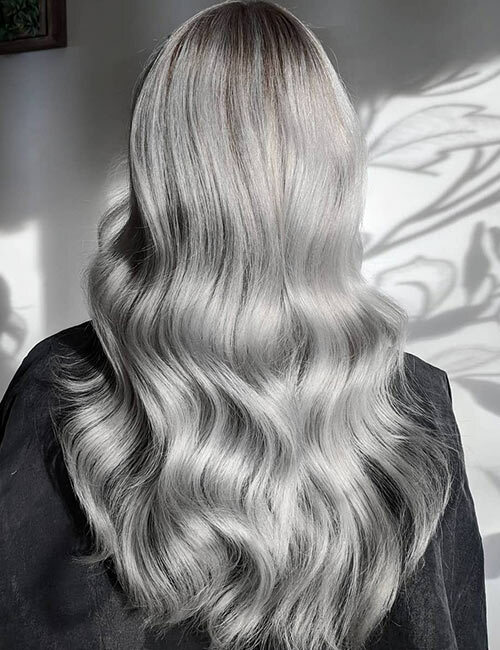 The color gray is pretty deep and intense, so it adds depth to your locks. The bun is one of my personal favorites. It’s also really easy to achieve, which means keeping the look fresh all night is easy as well. Gather your hair in a low ponytail. Leaving out the hair on the sides, topsy-tail the ponytail thrice. Pin the hair within the ponytail to create the low bun. Wrap the loose hair around the ponytail top and pin it in place to finish off the look. 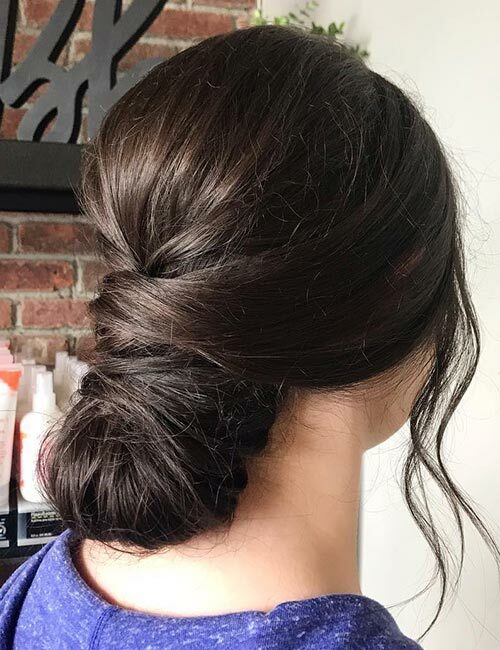 The high bun is another of my favorites. The question here is, how high and big do you want it? Place it near the crown to create a Cinderella-esque look. If you have thin hair, use hair extensions to add volume to the ‘do. Yes, short hair is perfect for homecoming! The angled bob is a big favorite this homecoming. If you have been dying to chop off your locks, this is the perfect time. 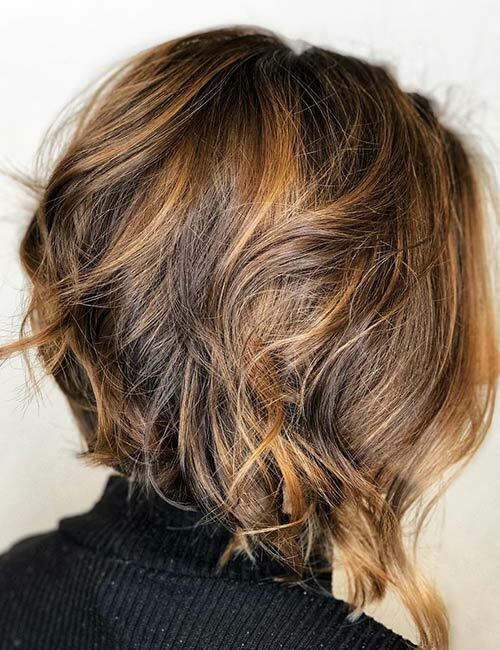 Get your locks cut in an angled bob and add some dimensional highlights to give it some depth.